Wearing my favourite kimonos, trying a new outfit colour combination and an old favourite. And also sharing more about what happened when a bird flew into my house, as I mentioned in my Insta stories a few weeks ago. This was set to be a busy day. My mother in law came over to watch the boys for a few hours. Before I hopped in the car, as I always do, I stopped for a minute to take photos. Like usual I left the house door open so the boys could watch me and know I was still nearby. Just as I'd taken my photos a flock of noisy miner birds flew overhead and I stood there amazed as one flew into the house through the open door. Ran in to Toddler T excitedly telling me there had been a bird flying around the ceiling. Poor thing then flew into the window and fell....into Cooper's waiting jaws. Luckily he dropped the little guy on command, and I was able to wrap the injured bird up in a tee that was next to the window. Quickly put him in a cosy little box to rest, called the vet and was going to have just enough time to drop off the bird before racing to my appointment. The little bird perked up on the way to the vets, was nice to hear him scrabbling around in the box. Was not so nice when I pulled up at the vets, turned off the ignition and he flew out of the box and around the car! After capturing him again and putting him in the box again (much harder this time with him flapping!) I took him into the vets. I'm fairly certain he has no wing damage from Cooper's teeth after he flew around the car, but the vet checked him over to confirm before releasing him. And I was only 5 minutes late for my first appointment of the day, phew! Outfit wise I really liked the colour combination with the navy and burgundy and brown. I wasn't sure at first but decided to wear it anyway and try something different, and ended up loving this. It's been so long since I last carried this Chloe paddington bag too, brought it out after my bestie wore hers recently. Not a kid friendly bag with the heavy padlock, but nice for spending time without the boys. Last worn: Ray-Ban Wayfarer, navy kimono, navy ribbed tank, burgundy pants, tan Chelsea ankle boots, Chloe Paddington bag. Other ways to wear: navy kimono and denim shorts, navy ribbed tank and pink vest, burgundy pants in the office, tan Chelsea ankle boots and chambray dress, Chloe Paddington bag and printed pencil skirt. Perfect for pregnancy: navy printed kimono and green maternity tank, burgundy pants and a belly band with an early bump, ankle boots and dress in second trimester, Chloe Paddington in Second Trimester. This is an outfit pic that got lost on my computer- it's from April! As you can probably tell by the sandals. Definitely not sandal weather now, winter has arrived in Brisbane. To break up the monochrome outfit I added the pink Balenciaga sandals and the printed kimono. I love this grey kimono, it's got so many different colours in the print that it works nicely with so much of my wardrobe. Unlike the outfit combination, I knew this colour combination would work as I've worn the navy tank and floral kimono together before. This pic had gone unnoticed on my computer for a while as when I was wearing this outfit I took a picture for a Jeanswest competition on Instagram. Sadly I didn't win, but I did have fun taking over 20 photos as the boys ran around in circles! This outfit picture was in a big block of those photos and I hadn't gone through them to realise I still had an unposted blog picture. Glad I could share it now, as I really liked this outfit. Last worn: Ray-Ban Wayfarer (above), Somedays Lovin' kimono, navy breastfeeding tank, skinny jeans, Balenciaga studded sandals, Rebecca Minkoff mini MAB satchel. Other ways to wear: Somedays Lovin' kimono and green top, navy breastfeeding tank and striped maxi skirt, skinny jeans and grey tee, Balenciaga studded sandals and chambray dress, 30 ways to wear Rebecca Minkoff mini MAB satchel. Perfect for pregnancy: kimono and maternity shorts in third trimester, navy tank in third trimester, studded sandals in second trimester with maxi dress, MAM bag and maternity pencil skirts. A navy tank is a great neutral basic that can be worn many ways in your wardrobe. If your outfit is feeling a little plain or monochromatic, add a printed kimono for some more colour and interest. Picking a similarly coloured kimono like in the first picture is a good fail-safe idea if you're playing with colours elsewhere in your outfit. Linking up with Passion For Fashion, Friday Favourites, The Ultimate Rabbit Hole, Ladies Who Link Up, Mummy Mondays, Shoe & Tell, Mix It Mondays, Modest Mondays, Hello Monday, On Mondays We Link Up, On Trend. Now that is quite a story with the bird. Great thing your dog is so well trained, our cat would just have run off for a feed. Oh wow what a story! I'm impressed that Cooper dropped the bird... good dog! Glad that you even made it to your appointment only a few minutes late. I love both looks--the color combo in the first look is one of my favorites for fall! Aww poor bird, at least Cooper is a very well behaved dog and dropped him on command. It's nice that your vet will look at a bird. Most around here won't give a wild animal the time of day. That's so sad! Here they have to take in any injured animals. Only the native ones get rehabilitation though, the introduced species (regarded as pests) are usually made comfortable and put down. Wow, I'm so happy you saved the bird! A store I used to work at always had birds flying in the front door - it was always so traumatic to catch them and get them outside again! Love the dark brick red jeans in the first pic - these are a nice complement to the blues of the clothes and your brown bag. Omg'd Mica! I'm so glad the bird ended up being ok. What a story! HaHaHa I love that navy & burgundy color combination. Looks so good together! Such lovely outfits :) I remember the miner bird from IG so glad it was okay. Woah, what an eventful morning. I'm impressed that Cooper dropped the bird on command! Love those maroon pants on you! The floral kimono is so sweet and a really lovely piece to have in a summer wardrobe. Have a fabulous weekend! I am all over this kimono trend! They are such the perfect lightweight covering in the summer! Now I need to ask myself why I only have one? Ha ha!! You can never just have one - I have so many, haha! Talk about getting in a flap! What a morning! I'm pleased the bird (and you) survived to tell the tale. 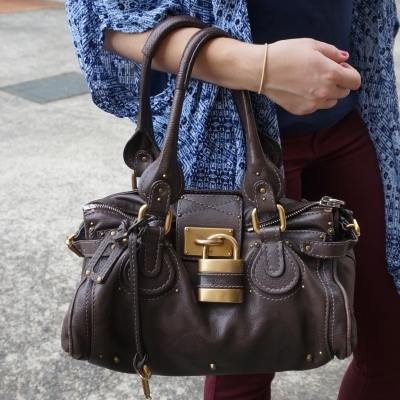 Love that brown Chloe bag! I think these are some of my most favorite looks of yours! Especially the first outfit, love the contrast with your jeans and kimono! Oh my gosh, I don't know what I would have done with a bird in the house! The neighborhood cats are one thing, but a bird! :-0 I'm glad he's alright (and hopefully you aren't scarred for life!). My dad recently rescued an injured bird at our house and had a similar problem catching him and keeping him in the box! You always have the best kimonos, and I love how you styled both of them! So glad that you were able to save the bird! I love the combo of navy and burgundy! And the kimono is a perfect finishing touch! You look gorgeous! I didn't know that navy could look well with a floral kimono! I usually pair kimonod with white/pink... Now you gave me an idea. I am so glad that the bird was okay! Navy is one of my favorite color so I have to love this kimono! Nice look! haha! I love the big bulky lock. Can be heavy though! What a story! So glad the bird was fine. Love your kimono! This is such a great story and post! I love your outfit too! Thanks for joining Ladies Who Link Up and hope to see you next week! haha I understand your kids being grossed out! I like your style, it's casual and seem comfy too. Those bags are my favorite! I do love the first colour combo, burgudy works great with blue...The second outfit is also very cute. You look lovely. Most people wouldn't have bothered with the bird, I'm so happy you weren't one of them. Great story and love the outfit. You look so cute and rock a kimono so well! I love how much colour you bring into your outfits! Very cute outfits. I love the kimono look, light and comfortable. Easy to throw on to dress up an outfit, and I am all about making things easier! Oh wow quite a story Mica ! I am so glad the bird did well. I've tried saving birds before and it did not end well. I cried my eyes out when the little one died in my hands. 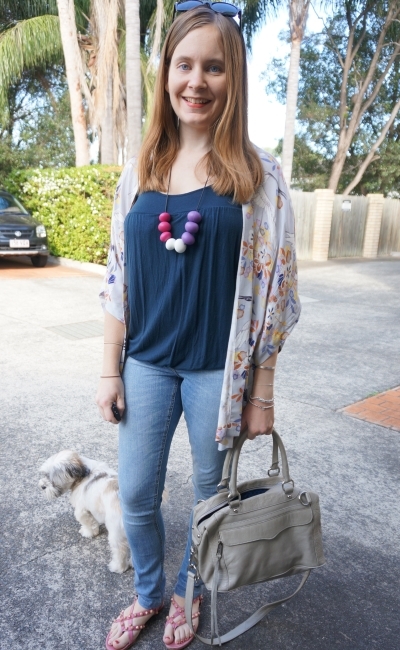 That bag, the Chloe paddington is superb and I wore my kimono recently too! I love your kimono even though you have a hard time styling it! Oh my goodness! What a wonderful soul you are to take that bird to the vet! Glad no one was injured during his rescue ;) I love the look of your kimonos...I never even thought of wearing one. They would be a great alternative to a cardigan for summer! You know I love a good kimono now! I never used to wear them until this summer just past, now I love to throw one over whether I'm shorts or jeans. They just work! Love the colour inspo here too, so thank you! Wow I never thought to use a kimono like this before :) I have an authentic one given to me by my brother's ex-girlfriend years ago! It's so beautiful but I've never figured where to wear it to! Goodness what an adventure for the bird! Glad you got it in safe hands. The love that combo in the first outfit. We've already had that conversation about burgundy, but it also looks fab with navy and brown. Mica---I love how you show items a couple of ways!! And kimonos are the perfect topper for the summer!! Thank you all for your lovely comments - glad I could give you some kimono inspiration!